Africa RISING’s research component (3) focuses on market value chains. 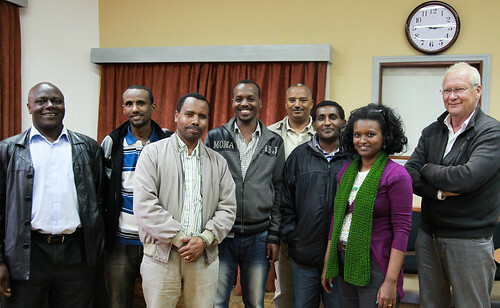 The Ethiopia team working on these issues met this week to review the work plan for market and value chains in the project. They also discussed the tools to be used to collect relevant data and information. 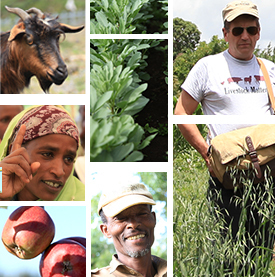 The team comprises staff from CIAT, ILRI, CIP, the LIVES project, and colleagues from the Oromia (OARI), Amhara (ARARI) and Southern nations (SARI) regional research centers. Understanding market and value chains is an important part of the project. Discussions and reflections on Day 1 focused on the objectives of the market studies and their implementation. The value chain studies will focus on both commodities that generate income and commodities for food purposes; it is critical that income generation and food security objectives are attained. All the information will ultimately lead to a structure that will facilitate the promotion and uptake of innovations among the farmers that will lead to improvement of incomes and nutrition of the households. This will be through bringing in new actors, exchanging knowledge, creating linkages, building on existing forums and structures in an integrating manner. Discussions on Day 2 focused on the enterprises map, the value chain mapping tools and budget and logistical issues for data collection. Building on previous work in the project (components 1 and 2) the team was able to reduce the possible enterprises for subsequent value chain analyses to 3 crop and 3 livestock enterprises. Criteria used were: the enterprises were equally preferred by men, women and youth, the enterprises had a commercial orientation or importance and finally, the enterprises were preferred across the four sites for ease of scalability and cross-site learning. Based on these criteria, the enterprises selected are wheat, potato, faba beans and dairy, ox fattening and sheep production. The next step is to conduct a value chain mapping of the enterprises at the district levels in the project sites to understand the structure and actors in these value chains as well as the gaps. A checklist to guide data collection was prepared. Meanwhile, collation of secondary data relating to the identified enterprises will continue in parallel with the mapping exercises.